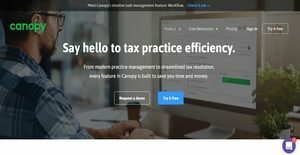 Canopy is a tax resolution and practice management platform designed for tax professionals, accountants, and tax attorneys. It aims to simplify tax working and tax engagements, enabling users to organize their workflows, tasks, documents, billing, and invoicing. Canopy also allows users to organize and manage their contacts and link their clients to other relevant contacts. In addition, it offers a client portal, where their clients will be able to share files with them and answer surveys. As a tax resolution software, Canopy enables users to instantly find the best course of action for their clients who are involved in cases such as penalty abatement, innocent spouse, liens, levies, and trust fund recovery. Through the aid of its collection analytics, users will also be able to provide the best collections solution suited for their clients. Last but not the least, Canopy offers an unlimited storage of any type of files: spreadsheets, .jpeg, or .mov files. One of the powerful features of Canopy is its tax resolution analytics. This feature allows users to determine the best course of action for their clients’ cases. The tax resolution analytics of the software is guided by resolution service assistants, which are automated helpers that provide possible outcomes based on client’s’ information and answers to calculated questions related to a client. Users furthermore receive notifications for any relevant information that might affect their client’s case. An example of this is when the amount claimed exceeds the IRS (Internal Revenue Service) Standards. As the tax resolution service assistants recommend outcomes, users will be able to compare these possible outcomes and identify the best resolution for cases: penalty abatement, innocent spouse, liens, levies, and trust fund recovery. This feature is also implemented in providing collections resolution for clients. Based on information gathered from client surveys and source forms, collection insights are automatically generated and outcomes or results are automatically calculated. Moreover, Canopy offers an IRS form tool as part of its practice management functionality. The IRS form tool allows users to electronically fill out IRS forms. Users’ information and their client’s contact information are auto-populated into IRS forms. With this tool, users will be able to save time, as it helps them fill out and accomplish confusing forms. Canopy also offers a collaborative client portal. Clients will be able to access this portal through invitations from users. Once they are able to login to the client portal, they will be able to view a dashboard which shows everything they need to do on their end. The client portal enables users and their clients to share files with each other. Clients can easily share files with users by simply dragging and dropping them into the portal. This drag-and-drop functionality is useful in sharing documents that need to be signed and returned. Moreover, through the aid of bots, users will be able to set and send automatic reminders to their clients with regards to the files or documents they need to submit. If you are interested in Canopy it might also be sensible to check out other subcategories of Best Business Process Management Software listed in our base of B2B software reviews. It's important to note that hardly any app in the Business Process Management Software category is going to be an ideal solution able to fulfill all the requirements of all company types, sizes and industries. It may be a good idea to read a few Canopy reviews first as specific services may dominate exclusively in a really narrow set of applications or be created with a very specific type of industry in mind. Others can function with a goal of being easy and intuitive and therefore lack complicated features desired by more experienced users. You can also come across apps that cater to a broad group of users and provide a rich feature base, but that usually comes at a higher price of such a software. Make sure you're aware of your requirements so that you pick a software that offers exactly the functionalities you look for. How Much Does Canopy Cost? We realize that when you make a decision to buy Business Process Management Software it’s important not only to see how experts evaluate it in their reviews, but also to find out if the real people and companies that buy it are actually satisfied with the product. That’s why we’ve created our behavior-based Customer Satisfaction Algorithm™ that gathers customer reviews, comments and Canopy reviews across a wide range of social media sites. The data is then presented in an easy to digest form showing how many people had positive and negative experience with Canopy. With that information at hand you should be equipped to make an informed buying decision that you won’t regret. What are Canopy pricing details? What integrations are available for Canopy? If you need more information about Canopy or you simply have a question let us know what you need and we’ll forward your request directly to the vendor.